I don't know about you but it's the middle of the week and I already need a pick-me-up. I'm totally digging just how sassy do these chrome nails look. 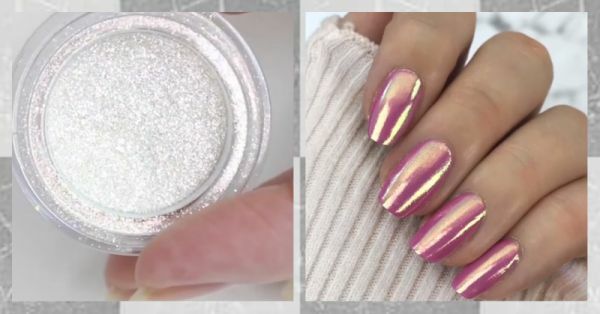 At first, this nail art design looks tricky, but after watching this tutorial video, I bet you'll feel inspired to give it a try at home. Let's check out, shall well? Step 1: Paint your nails bright pink. Step 2: Once dried, apply a coat transparent nail polish. Step 3: To avoid getting nail polish stains on your fingers, place a liquid nail art tape around each nail. Step 4: Now for the main part, dip each nail into a pot of chrome powder. Step 5: Rub and blend the powder till your nails become shiny and shimmery. Step 6: Peel the tape off from each nail and use a nail brush to wipe off any excess chrome powder. Note: You don't have to seal the design by applying a top coat, but if you want to, then a gel top coat might work!